The stockings were hung . . . While researching methods to hang Christmas stockings, I found some really cute and clever ideas. I am always amazed at the creative ability of some folks. In this week’s blog, I want to share some of the great stocking hanging methods I discovered. Hangers are generally divided in to two types: weighted hangers and some type of clip or hook. Weighted hangers come in an array of styles and designs and are usually made of cast iron, bronze, pewter, or other heavy metal. They can weigh a pound or more and have a slip-resistant pad on the bottom to protect the mantle. Because of their weight, these are not good choices if you have small children. Christmas characters, trees, snowmen, and Santa are popular figures found on the weighted hangers. Hooks and clips are popular methods of hanging stockings. Hooks are economical and come in many sizes and styles. Check out great selection of coat hooks at Van Dyke’s Restorers. Hooks are lightweight and can be discreetly hidden under greenery, garland, ribbons, and strings of lights. A major disadvantage of hooks is drilling holes in your mantle or walls. There are several ways I discovered to avoid this problem. 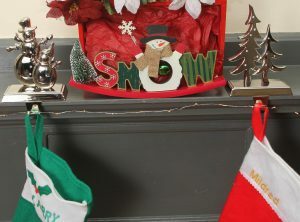 A simple box with decorative accents is placed on the top of the mantel with the hooks attached to the side of the box. This saves your mantle and adds a decorative accent piece. I made the one pictured below. Add a weight in the bottom to avoid tipping over when you add gifts. Another clever method of hanging stocking is using a decorative curtain rod supported by ornamental weighted hangers. Curtain rods come in many styles and are relatively inexpensive. No fireplace; no problem! The freestanding wooden tree is another fun way to display your stockings. I discovered a number of pretty tree hangers styles. The trunk can be made from a 4 x 4 post or decorative columns. Van Dyke’s offers hundreds of columns and posts in many sizes and styles. Hooks or cabinet knobs are then added for hanging the stockings. Hooks and knobs can be attached to fencing made from scrap lumber for a great look. Make a decorative plaque with your family name or holiday greeting and add hooks or knobs. 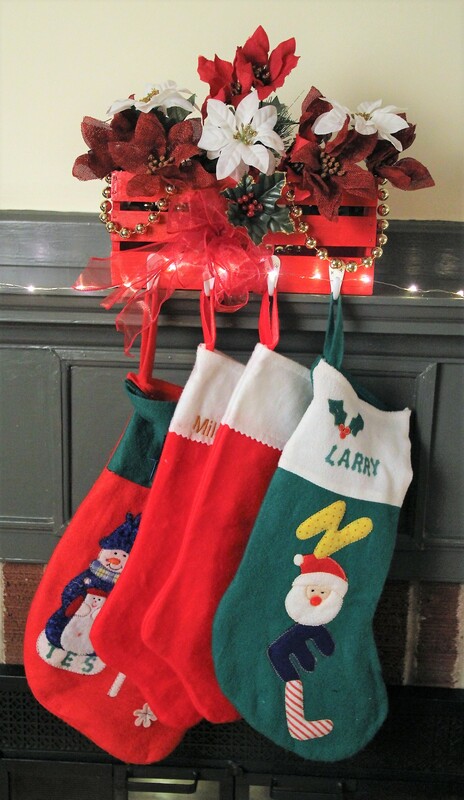 The methods of hanging your stockings are as vast as your imagination and creativity. We have pinned a number of our favorite stocking hangers on our Pinterest page. Happy Holidays.